Uninterrupted power supplies come in various sizes, types, and capacities, to serve your power backup requirements. UPSs ensure reliable and safe operation only if you adhere to certain operational rules and safety precautions while using them. Popular UPS distributors in Chennai say that following the operational and safety instructions enhances the life of your UPS and also gives you the best results. But do you thoroughly know what to do and what not to do with your UPSs? If no, then don’t worry! This article aims to provide an insight into the same! The right way to place a UPS is upright. Be it a traditional rack-type UPS or tower-type, place it upright and steady. You should not keep your UPS outdoors and in places where humidity and temperature are high. Places which are directly exposed to sunlight and moisture should also be avoided. You should not fully cover your UPS or keep it in a completely enclosed area. Keeping it covered or enclosed hinders the functioning of the heat dissipating holes or pathways which may affect its operation. Every UPS has its own load capacity which would be explicitly mentioned in its specifications. Do not connect loads greater than its capacity; doing so may a tripping if you have a circuit breaker installed or directly short-circuiting if otherwise. So, pay attention to this point to ensure trouble-free operation of your UPS. Some type of UPS has extra sockets for protecting your electrical and electronic appliances from voltage surges. These sockets may not provide power backup but only surge safety. So while connecting different devices to the UPS, manage it in such a way that devices which require only surge safety are connected to these sockets, and those which require both power backup and surge safety are connected to the main sockets. 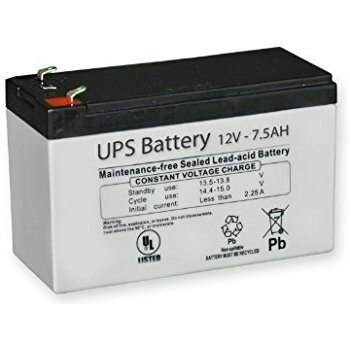 Generally, the UPS battery requires no regular maintenance. But this may vary depending on manufacturers. Hence you have to check the same with them. Usually, if the battery fails, then the only option is to replace it with a new one. Do not do it alone; take the help of a professional technician. Before beginning the operation, it is advisable to charge the UPS for a period of twenty-four hours (or the duration mention in the instruction booklet). Keeping your UPS in the discharged mode for a long time is not good for its operational efficiency. So, try not to keep it so. Closely following the above-listed points ensure the operational efficiency of your UPS. Now let us move on to the safety precautions that you have to be aware of while using a UPS. Knowing the same beforehand saves you from regret afterward! A list of UPS safety precautions for quick reference! Do not install UPS in an outdoor area which is open to direct sunlight, moisture, thunderstorms or other drastic climatic conditions. Only a skilled technician should do battery replacement. Do not open the UPS cover unnecessarily. UPS off and disconnecting it from the mains. After switching it off, wait for five minutes so that the capacitors get discharged. UPS must be rightly grounded; failing to do so may have hazardous consequences. Do not operate the UPS at a temperature and humidity level far high or below the specified limits. Do not open the UPS battery; the materials inside may be harmful to your skin and eyes. Burning the battery involves explosion risk; so never burn it. Once its life is over, dispose it off as per the disposal instructions provided with it. The rules may differ slightly depending on the type, the brand, etc. of the UPS; but most of the ones listed here apply for all UPSs in general. So, follow them strictly to ensure a safe and long life for you as well as your UPS!